Circulators are important components in communication technology. Their unique way of routing light usually requires centimeter-sized magnets, which are difficult to miniaturize for use on optical chips. Researchers at AMOLF and the University of Texas have circumvented this problem with a vibrating glass ring that interacts with light. They thus created a microscale circulator that directionally routes light on an optical chip without using magnets. The researchers published their work in Nature Communications on 4 May 2018. Circulators allow the transmission of information without loss among more than two nodes in a network, which is why they are widely used in optical networks. Circulators have several entrance and exit ports between which they route light in a special way: light entering a particular port is forced to exit in a second port, but light entering that second port exits in a third port, and so on. "Light propagation is symmetric in nature, which means if light can propagate from A to B, the reverse path is equally possible. We need a trick to break the symmetry," says AMOLF group leader Ewold Verhagen. "Usually this trick is using centimeter-sized magnets to impart directionality and break the symmetric nature of light propagation. Such systems are difficult to miniaturize for use on photonic chips." Verhagen and his colleagues created circulating behavior using a microscale glass ring resonator with a different trick. They let light in the ring interact with the ring's mechanical vibrations. The researchers used this principle in earlier work to demonstrate one-way optical transmission. 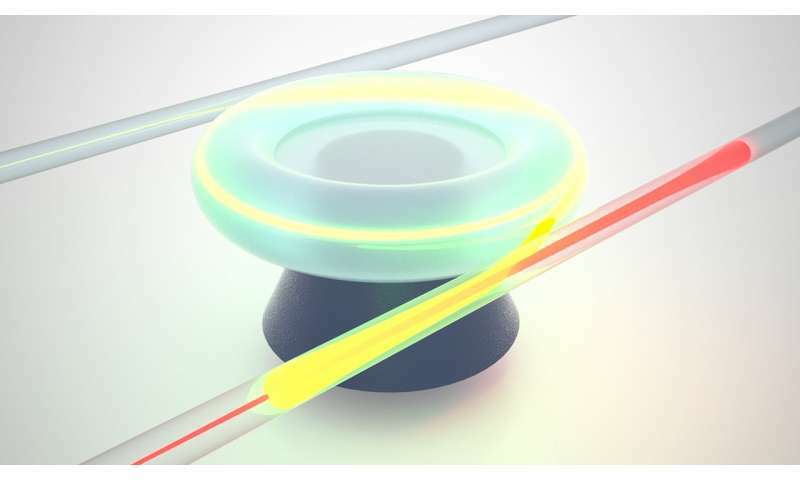 "By shining light of a 'control' laser in the ring, light of a different color can excite vibrations through a force known as radiation pressure, but only if it propagates in the same direction as the control light wave," Verhagen explains. "Since light propagates differently through a vibrating structure than through a structure that is standing still, the optical force breaks symmetry in the same way as a magnetic field would." Turning the 'one-way street for light' into a useful optical 'roundabout' was not as straightforward as it may seem, as postdoc John Mathew points out: "The challenge is to dictate the particular exit to which light can be routed, such that it always takes the next port." The researchers found the solution in optical interference. Careful control of the optical paths in the structure ensures that light from each input constructively interferes in exactly the right output. "We demonstrated this circulation in experiments, and showed that it can be actively tuned. The frequency and power of the control laser allow the circulation to be turned on and off and change handedness," says Mathew. The AMOLF 'roundabout' for light is actually the first magnet-free, on-chip optical circulator. Although the research is fundamental in nature, it has many possible applications. Verhagen: "Devices like this could form building blocks for chips that use light instead of electrons to carry information, as well as for future quantum computers and communication networks. The fact that the circulator can be actively controlled provides additional functionality as the optical circuits can be reconfigured at will."